Among the plethora of things that have been keeping me busy of late, sewing and costume making have really been up there in the top five time consumers. Not that I am complaining, as the result is being able to spend time with my friends and family being big kids at amazing historically important sites around the country. 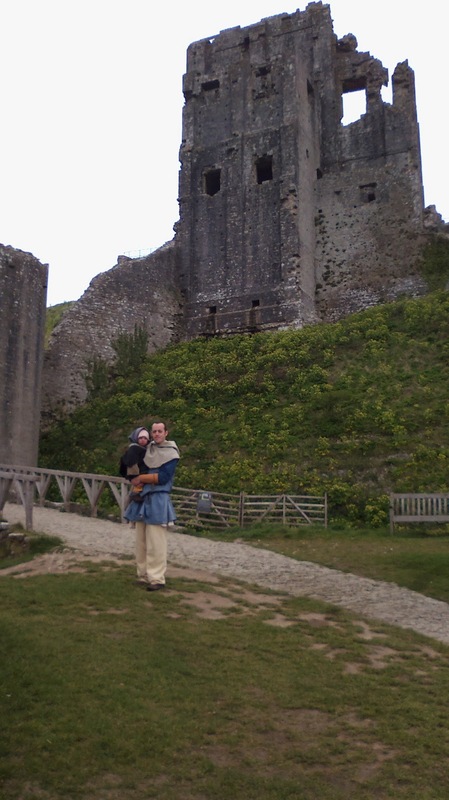 Last year we were at Corfe Castle for the May bank holiday weekend. Excitingly, it's all happening again this weekend, and thankfully the weather reports look great this time. We are members of the Vikings, an international society of re-enactors whose members represent the people of the dark ages, including Anglo-saxons, Vikings, Normans and I've even met a Rus character. We joined in late 2011 after a few years of 'wouldn't it be lovely' every time we saw the re-enactors at the Battle of Hastings. We're still very green and unworldlywise in the ways of the group, so it is at this point I should say that the views expressed herein are mine solely and not those of the Vikings, etc.. etc.. I had a little lad at the time we met the Vikings, and another on the way. An old African proverb says that it takes a village to raise a child, and lacking a village we went out and found one. For the boys, it has been a lovely opportunity to gain extra aunts, uncles, cousins and grandparents, and to dress up and run around with lovely kids in great locations. For myself, I have learned several new craft techniques, including naarlbinding (Viking knitting, done using a single needle) and lucet cord making, as well as having sewn whole articles of clothing from scratch for the first time in my life. We spent most of last year as part of the Living History team demonstrating costume, food and crafts and being repeatedly asked 'is he a real baby' about Toby, as members of the public were amazed to find babies and children included in the re-enactment. This year, Matt has recently passed his display archery test, so I'm looking forward to seeing him in action at the butts. We've made firm friends, who we even see outside of Viking events, and are thoroughly looking forward to spending time with everyone soon. For anyone looking for a way to really learn about history beyond that dates of battles and the names of kings, I would highly recommend getting involved. We've joined Caent Herred, based in Canterbury, but there are groups all over the country, and several abroad including America. Have a look at the website below for more information and details of people to contact about joining the Vikings. If you're an educator or events organiser, there are also details on the site which will allow you to book a viking delegation for your open day or other happening. This sounds amazing Maz, I've read your facebook updates about this before and I always think it looks so much fun! I bet the boys will be amazing at history when they get to school too!